OK, I’ll be hanging out next to this sign, I guess, so my enemies will be foiled! 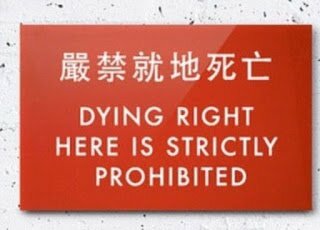 This entry was posted in Bad Signs, Bad Translation. Bookmark the permalink. I have reached my overripe age because I have always thought that dying was the wrong think to do, if you can help it. In a roundabout sort of way, it seems that the some Japanese agree with me. I vote Chinese, with a little flourish on the ‘prohibited’. I can see so many applications for this sign.